Choosing a Mayfield Sun Deck from EVABEL is easy. Or visit Mayfield‘s unique Sundeck Designer to create your own holiday home sundeck. 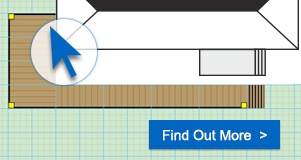 Our online Sundeck designer program allows you to design your own Sundeck in minutes and is easy and fun to use. We would like to thank John and Simon for the lovely job they did on our fencing at Fernwood. We have had many comments on how good it looks. They left everything tidy and deserved the 100 cups of tea I made them !!! Access ramps are also available and are built to the ‘National Accessibly Scheme’s Criteria’. In some cases VAT Exemption is available; when placing an order for an access ramp, please ask to find out if you or your organisation is able to take advantage of this. We are able to add a deck to any holiday home quickly and efficiently, even when the front has a shaped profile, provided the information is given at point of enquiry. I would just like to add what an excellent job has been carried out ... all the lads have been well mannered and a credit to your company. May I take this opportunity to thank all concerned for an excellent service. We are absolutely delighted with the overall appearance of the deck. It has been a pleasurable experience from my initial enquiry through to completion of the installation.